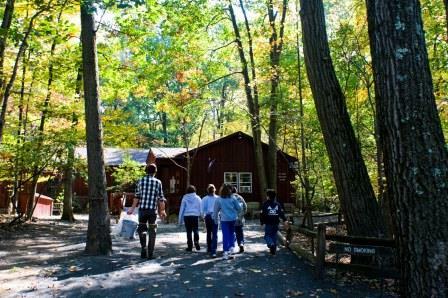 The Great Swamp Outdoor Education Center (GSOEC), situated on 44 acres on the eastern end of the Great Swamp National Wildlife Refuge, serves as an important crossroad between nature and civilization. You can walk along 2 miles of flat trails and boardwalk, from sunrise to sunset throughout the year, and enjoy the spectacular views of the swamp, marsh, meadow, pond, forest habitats, and wildlife. 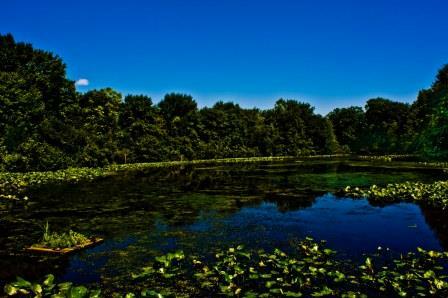 It is the unique intermingling of these habitats and diversity of terrain that gives the Great Swamp its unique character. Marvel at the many plants along the way, from the ferns, maples, and sedges of the swamps to the oaks, beech trees, and witch hazel shrubs of the forest. There is a myriad of wildflowers and wildlife. Perhaps you will have a rare opportunity to spot one of the many threatened and endangered species that call the Great Swamp their home. Venture into the Visitors Center to view the many interactive and educational exhibits designed to entertain and inform about the natural history of the area. A large mural with two dozen realistic, taxidermied animals helps you to develop a better understanding and appreciation of the types of creatures that call the Great Swamp home. Observe live reptiles and insects, test your nature knowledge with the many interactive displays, or attempt to fit inside a replica bear den. 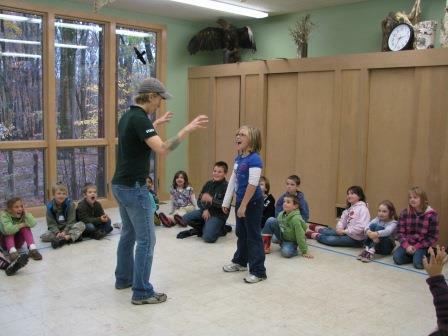 Touch and examine a wide variety of natural artifacts up close, or perform a nature puppet show at the puppet theater. 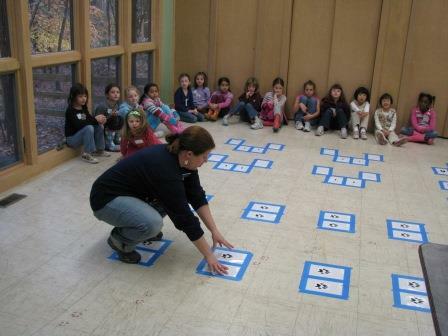 Enjoy using track stampers to make trails in the sandbox. Discover the latest wildlife spotted on the trails by checking the sightings board before you head out on the trails with a self-guided trail booklet, or a free seasonal scavenger hunt. Stop by the model wigwam behind the center to see what life was like for the Lenape Indians. Digital trail maps are available online. SPRING: Experience firsthand the many amazing changes in the natural world as winter loosens its grasp and spring begins. As you walk along the trails, listen for the ‘quacks’ and ‘peeps’ of wood frogs and spring peepers as they call for mates. The patient observer will also be rewarded with the cheerful songs and bright colors of migrating birds arriving in the area after wintering in the south. A multitude of color emerges in the plant life as well, from the yellow marsh marigold to the blue iris. 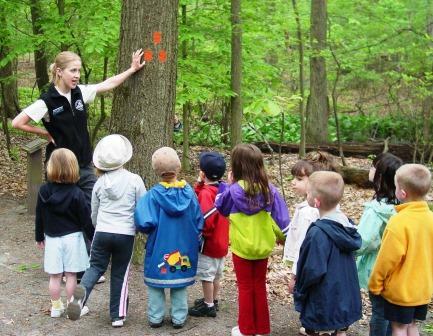 Highlights of spring programs include Nature’s Playground, Toddler Treks, Night Hike Adventures, and many more offerings for all age groups and interests. SUMMER: The summertime swamp is alive with sound and color, and wildlife is easy to spot along the trails. Dozens of painted turtles bask on the floating docks of the pond while green frogs blend in along the banks of the streams. The flowers of swamp milkweed, Joe Pye Weed, and Goldenrod attract scores of nectaring butterflies, and iridescent dragonflies patrol the wetlands. Sit on one of the many benches along the trails to enjoy the scenic views and the tranquility of nature. 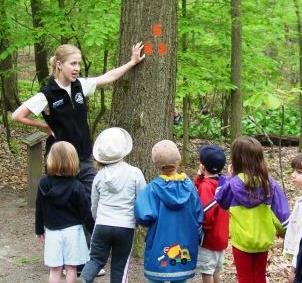 Highlights of summer programs include a wide variety of Adventures in Nature summer camps for children ages 2 to 18. 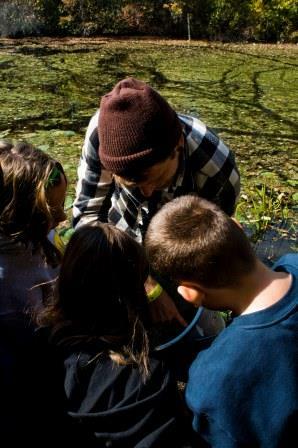 Naturalists can take you on a guided nature walks along the trails, pointing out wildlife and sharing interesting facts about the Swamp’s wild residents. The Great Swamp was created approximately 15,000 years ago by the melting waters of the Wisconsin Glacier, which poured into the natural basin of this area and created prehistoric Lake Passaic. When the lake eventually drained northward, it formed the Passaic River, leaving behind the rich soil from which the Great Swamp flora would grow. This incredible natural oasis was almost lost in the late 1950s when the Port Authority of New York and New Jersey promoted a plan to change the land into an international jetport. Fortunately, through the tireless efforts of grassroots activists, and state and local government officials, the Great Swamp basin was preserved in perpetuity as a National Wildlife Refuge (NWR). Including all the public lands, this area now covers approximately 8,000 acres and extends seven miles across and three miles wide. The Morris County Park Commission maintains approximately 44 acres on the eastern edge of the Great Swamp NWR at the Great Swamp Outdoor Education Center. 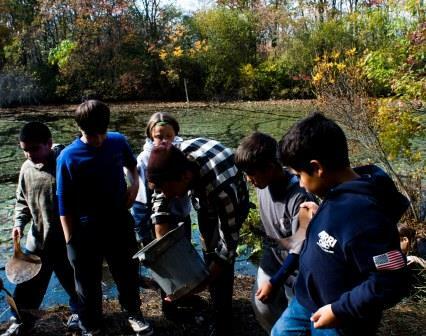 The GSOEC was opened in 1963, one year before the federal refuge was established, as the Morris County Park Commission’s contribution to the preservation efforts. 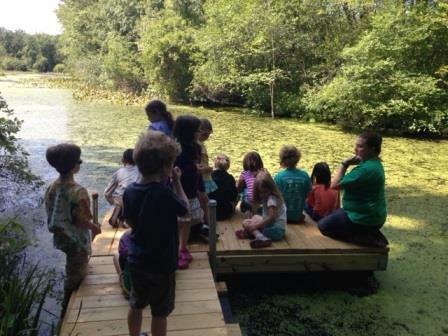 The Great Swamp Outdoor Education Center trails are open daily Sunrise to Sunset throughout the year. The Visitors Center is open weekdays 9 a.m. to 4:30 p.m. throughout the year and closed most weekends during the summer starting June 23.